When Ageless Automaton attacks a Guard, it gains +3/+0 and Breakthrough this turn. 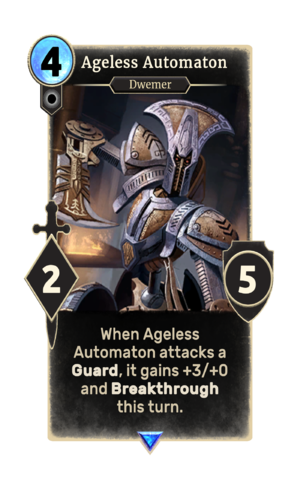 Ageless Automaton is a rare Neutral creature card. It is part of the Core Set. This card's ability applies the Destruction! card effect. The card is named for Dwemer automatons. This page was last modified on 24 September 2018, at 22:20.